You may be wondering why I would take the time to make hot chocolate in a slow cooker when I could easily just make it on the stove. Well, I saw a video on Instagram one day for it and thought it would be a nice treat, which it was. It was also a good excuse to use some white chocolate chips I had and to use leftover pumpkin puree I had from making Pumpkin Cannoli. All pretty good excuses in my book! In my slow cooker I added whole milk, white chocolate chips, pumpkin puree, cinnamon sticks, vanilla extract, ground ginger and freshly grated nutmeg. Trust me, it’s worth using freshly grated nutmeg as opposed to the powder form. Ground nutmeg can sometimes leave a pungent flavor, but, using freshly grated nutmeg eliminates that. After giving all of my ingredients a good stir, I set my slow cooker to low and let it cook for 2-3 hours. For the first hour, I gave the mixture a good stir every 10 minutes to make sure the chocolate was melting and to evenly distribute all of the ingredients. As an aside, is it still right to say cook when it comes to making hot chocolate? Or, maybe I should say simmer? Hmmmm??? I enjoyed it topped with whipped cream and freshly grated nutmeg and a cinnamon stick as a garnish/stirrer. I actually used one of the cinnamon sticks that I added to the slow cooker. 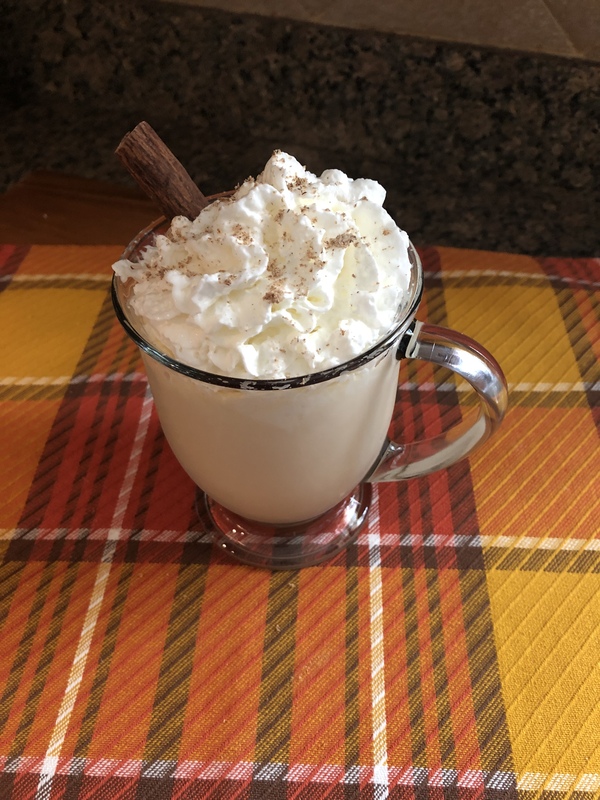 This is the perfect autumn warm-me-up beverage. Or, thinking ahead, an ideal complement to your Thanksgiving desserts. You could easily double or triple the recipe for a large group of people. 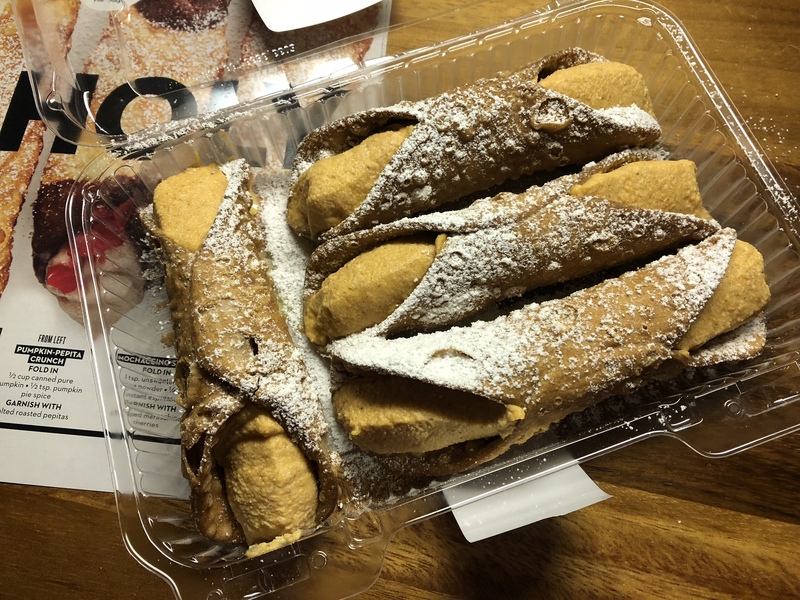 If you’re curious about the Pumpkin Cannoli recipe check back tomorrow! Combine the milk, chocolate chips, pumpkin, cinnamon sticks, vanilla, ginger and nutmeg in a slow cooker and stir together. Heat on low for 2-3 hours, stirring every 10 minutes for the first hour to stir in the melted chocolate. And occasionally after that. Serve in mugs, topped with topped whipped cream and freshly grated nutmeg. Add a cinnamon stick that can be used as a stirrer in case the pumpkin settles. 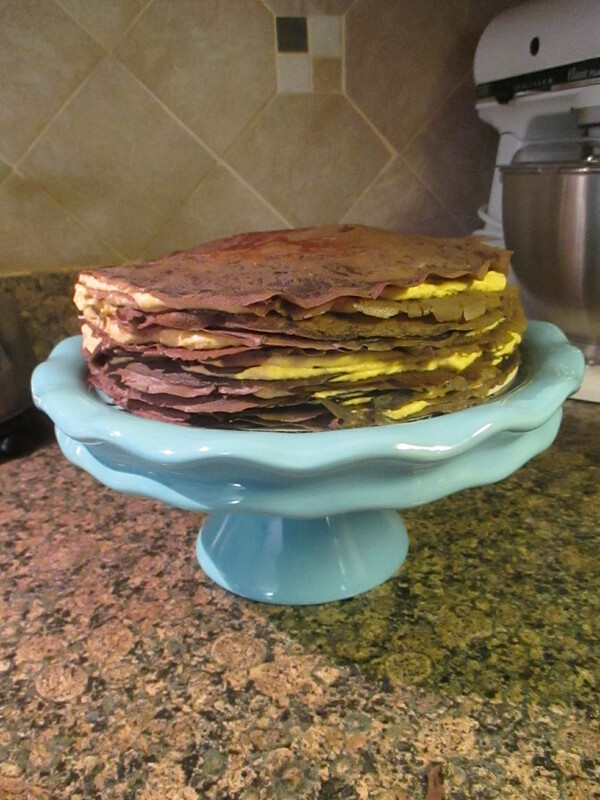 I first heard of crepe cakes because of a bakery in NYC called Lady M. While I have never tried it myself, I do know a few people who have and have given it rave reviews. I came across a recipe over the summer for a Lemon Mascarpone Crepe Cake that I really wanted to try but never got around to. I feel like those flavors are summer-like so I just decided to wait to make it. 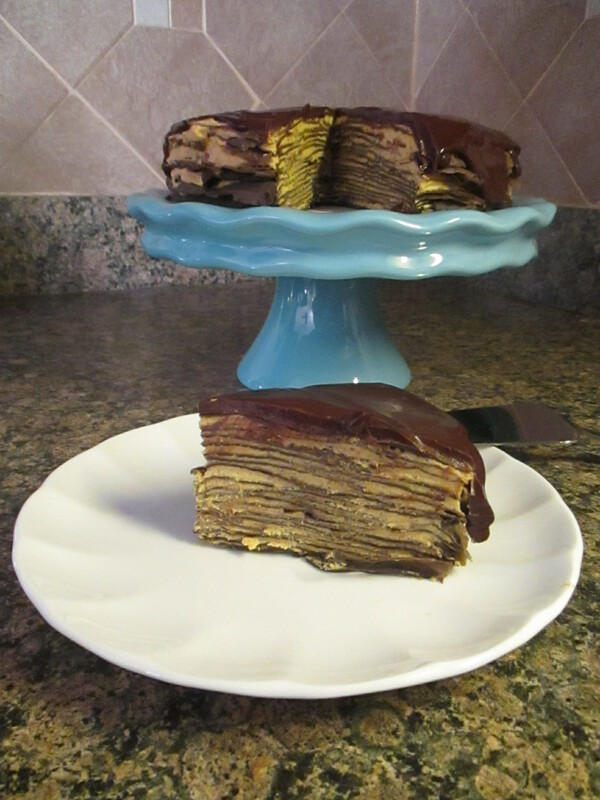 And then, I received the recent issue of Food Network Magazine and among the pages was a recipe for a Chocolate Pumpkin Crepe Cake, so I decided to give it a try. I’ll admit, the idea of making crepes was a little intimidating at first, but, once I had made a few I got the hang of it. To start, I made the pumpkin custard. Once made, I placed a piece of plastic wrap directly on the surface so the custard wouldn’t form a skin and refrigerated it for 2 hours. Next, I made the batter for the chocolate crepes. Which I let rest, covered, for about 2 hours. 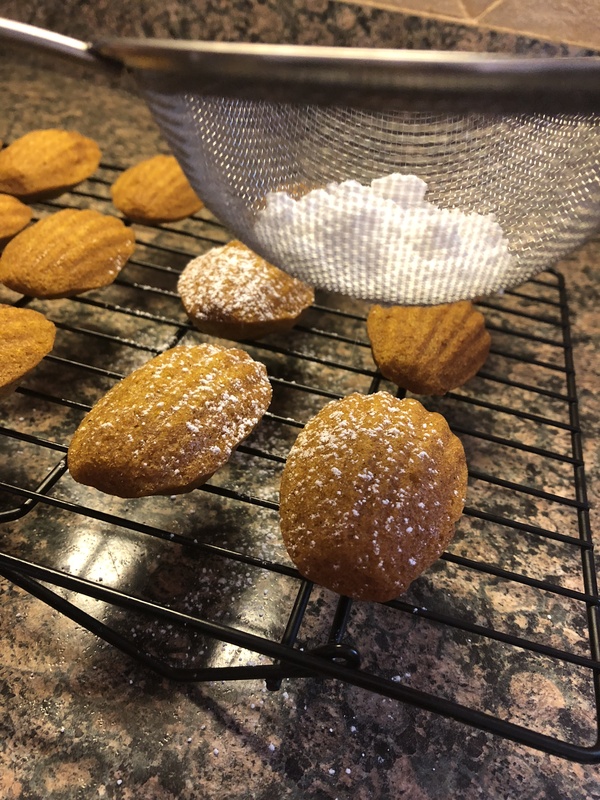 To finish the pumpkin filling, I beat heavy cream until stiff peaks formed and then folded it into the pumpkin custard and refrigerated the filling until it was firm, at least an hour. Next, I made the crepes. Below I have some included some tips on making the crepes. Here is a pic of my crepe making assembly line. Having things laid out like this really made the crepe making a breeze. 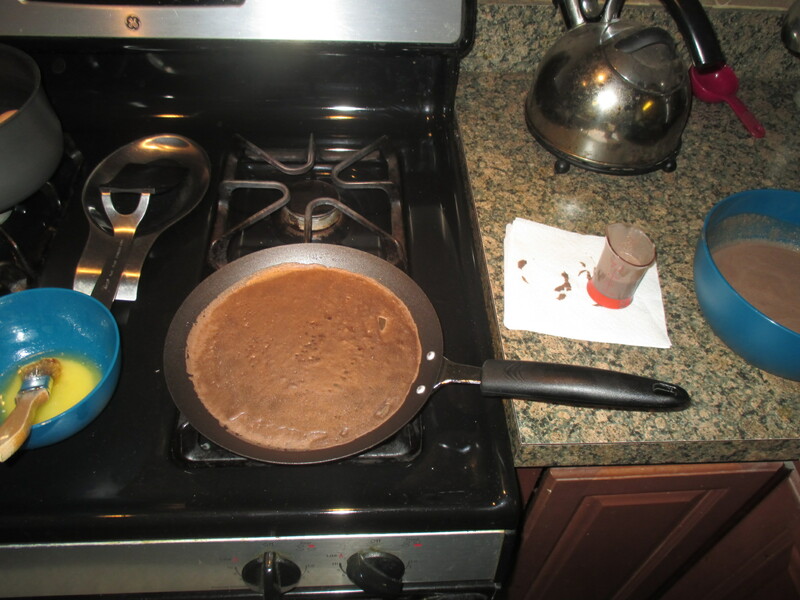 Also, I used a crepe pan as opposed to a non-stick pan to make them. I think using a crepe pan makes it easier due to the low angled rim of the pan… It makes flipping the crepes lest cumbersome. I ended up with 18 crepes, it would have been 19, but my first crepe was a fail. The same thing happens when I make pancakes. 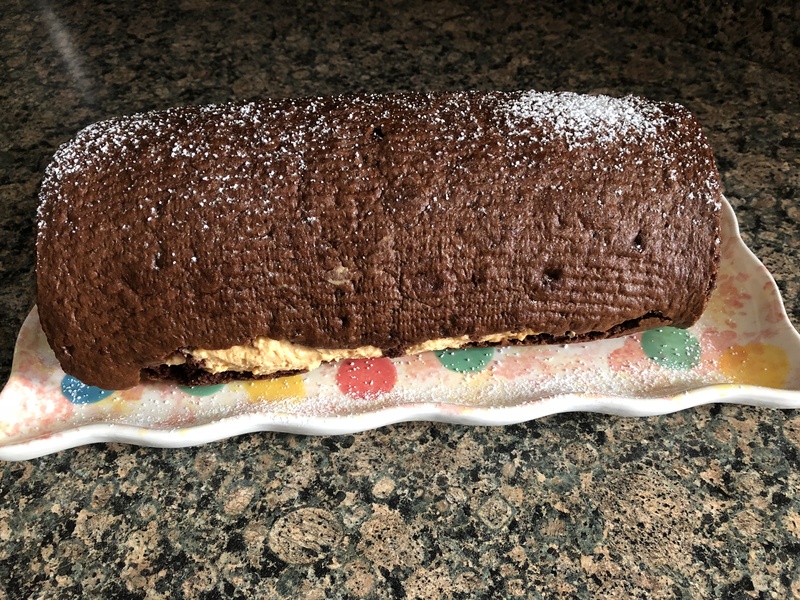 And once the crepes had cooled and filling was ready it was time to assemble the cake. I started and ended with a crepe, spreading about 3 tablespoons of pumpkin filling between each crepe. I then refrigerated the cake overnight. 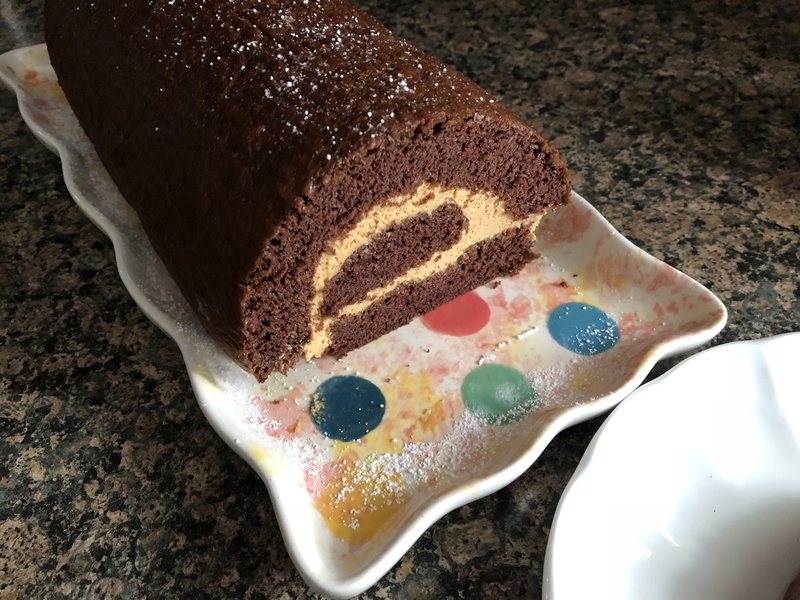 And after the ganache had set I sliced into the cake. It sounds cheesy, but, I was pretty excited when I cut into the cake and I saw how nice and perfect the layers look. There’s such a satisfaction you get when you feel intimidated by making something and in the end it comes up just as you hoped. And it didn’t hurt that it tasted pretty good as well. Chocolate and pumpkin are definitely a winning combination. 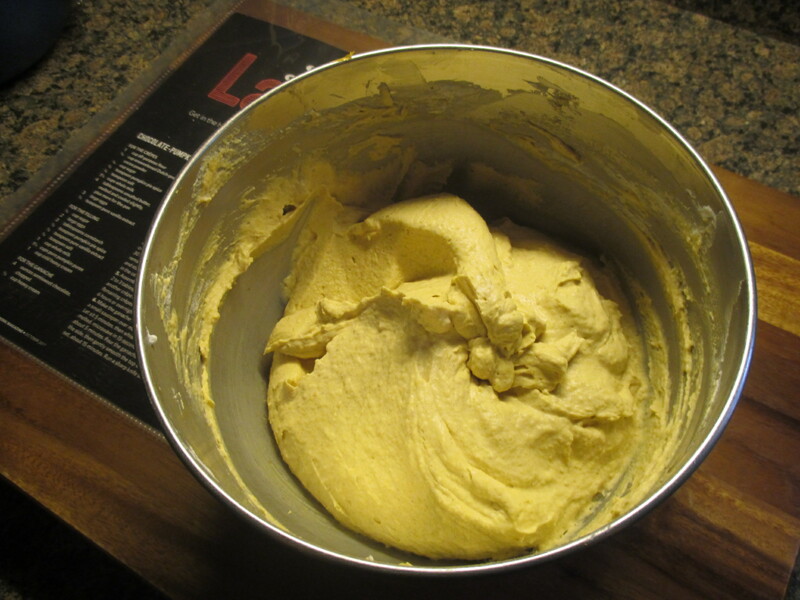 4 tablespoons unsalted butter, melted and cooled slightly. Plus more for the pan. Make the filling: Whisk the sugar, eggs, cornstarch, pumpkin pie spice, vanilla and salt in a medium bowl. Combine the milk and pumpkin puree in a medium saucepan and cook over medium heat, whisking until steaming. Gradually whisk in the egg mixture (don’t add it all at once or you will end up with scrambled eggs) and bring to a boil, whisking constantly until very thick. Strain the filling through a fine mesh sieve into a medium bowl, push it through with a rubber spatula. Place a piece of plastic wrap directly on the surface and refrigerate for 2 hours. Make the crepes batter: Combine the flour, cocoa powder, sugar, pumpkin pie spice, salt, milk, melted butter, eggs, and vanilla in a blender. Blend, scraping the sides occasionally until smooth. Transfer the batter to a bowl and cover, let sit for an hour. Finish the filling: Beat the heavy cream in a large bowl with a hand-mixer on medium-high speed until stiff peaks form. Working in three batches, fold the whipped cream into the filling until combined. Refrigerate at least an hour, until firm. Makes the crepes: Line a baking sheet with parchment paper. Heat an 8-inch nonstick skillet pan or a crepe pan over medium-low heat until hot; lightly brush with melted butter. Add about 3 tablespoons of batter to the pan and swirl to coat the bottom of the pan. Cook until the crepe is dry on the bottom and set on top, about 2 to 3 minutes. Carefully flip crepe and cook for 30 more seconds. Invert onto the prepared baking sheet. Repeat with the remaining batter to make about 20 crepes, brushing the pan with more butter and stacking the crepes as you go. 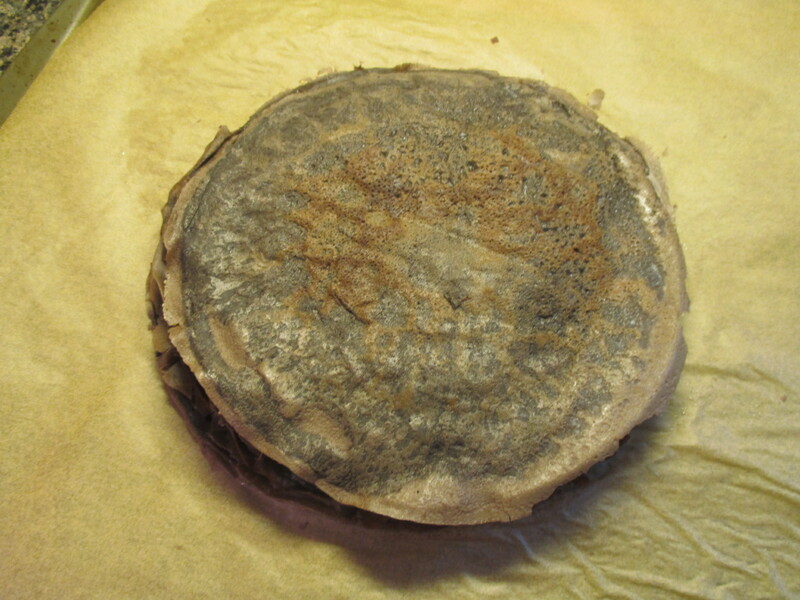 (If any crepes tear, don’t worry, you can use those in the middle of the cake). 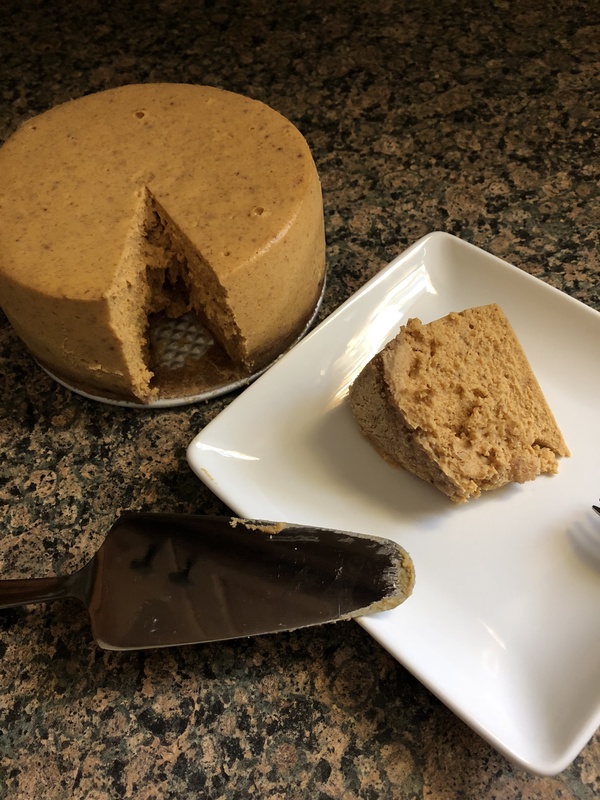 Assemble the cake: Lay a crepe on a plate or cake stand and spread with 2 to 3 tablespoons of the pumpkin filling, spreading it to the edges. Repeat this with the remaining crepes and filling, ending with a crepe. 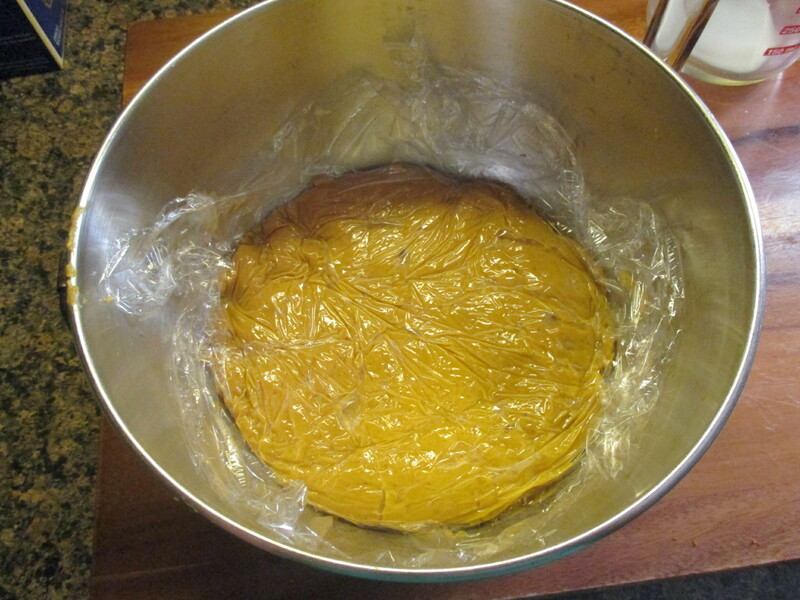 Lightly cover the cake with plastic wrap and refrigerate at least 6 hours or overnight. Make the ganache: Put the chocolate in a small bowl. 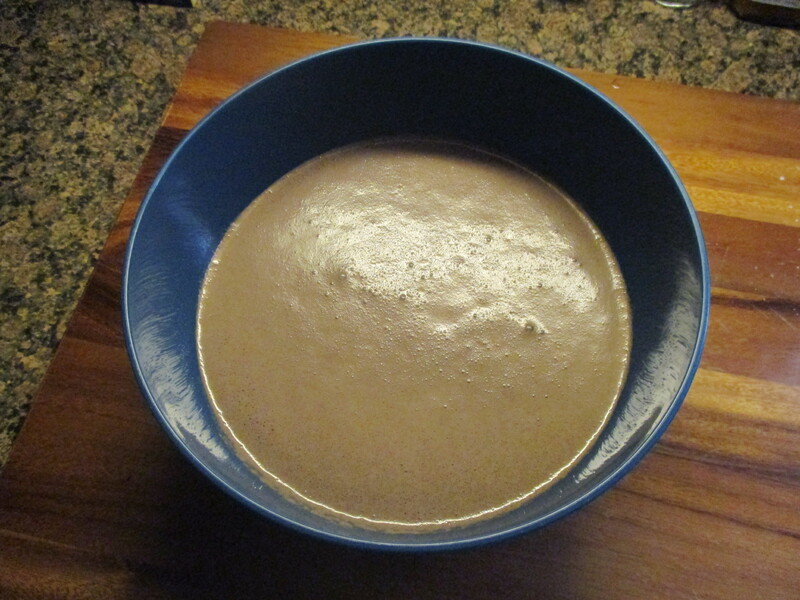 Heat the heavy cream in a small saucepan over medium heat until steaming, then pour over the chocolate. After 5 minutes, whisk until melted and smooth. 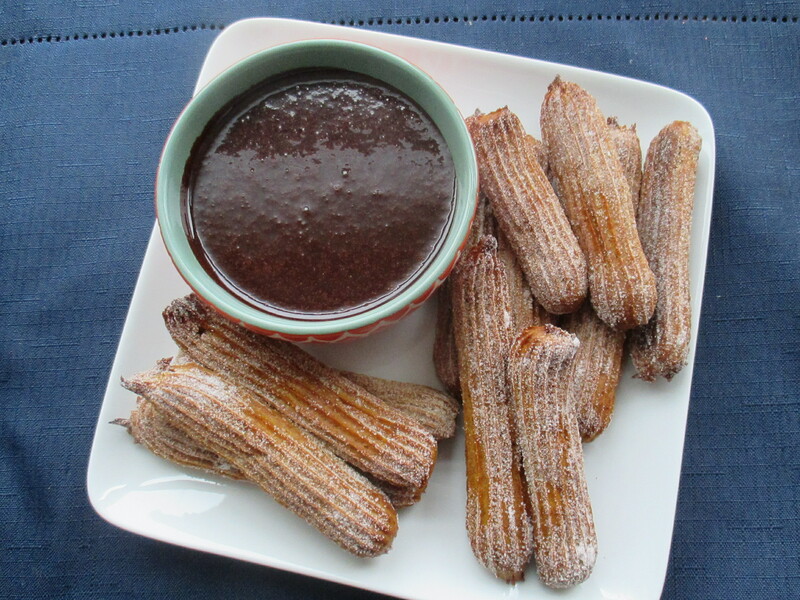 If the chocolate isn’t completed melted, microwave in 15-second intervals. Let the chocolate sit for about 5 minutes, until it has thickened but still pourable. 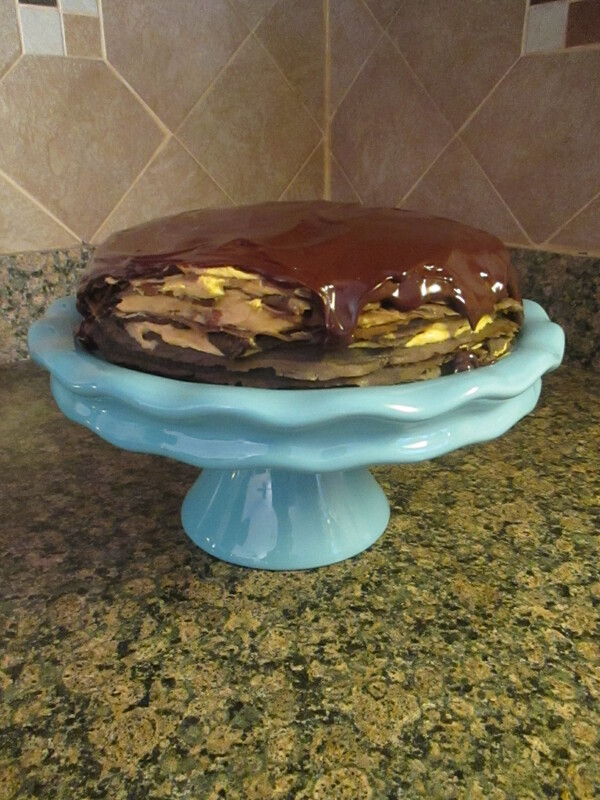 Pour the chocolate over the cake letting the excess drip down the sides then smooth the top with an offset spatula. Let the chocolate set about 15 minutes. To slice, run a sharp knife until hot water. Let the batter rest for at least an hour, if not the crepes will tear easily. Butter the pan after every other crepe. Also, don’t put too much butter on the pan, it will take longer for your crepe to dry out. 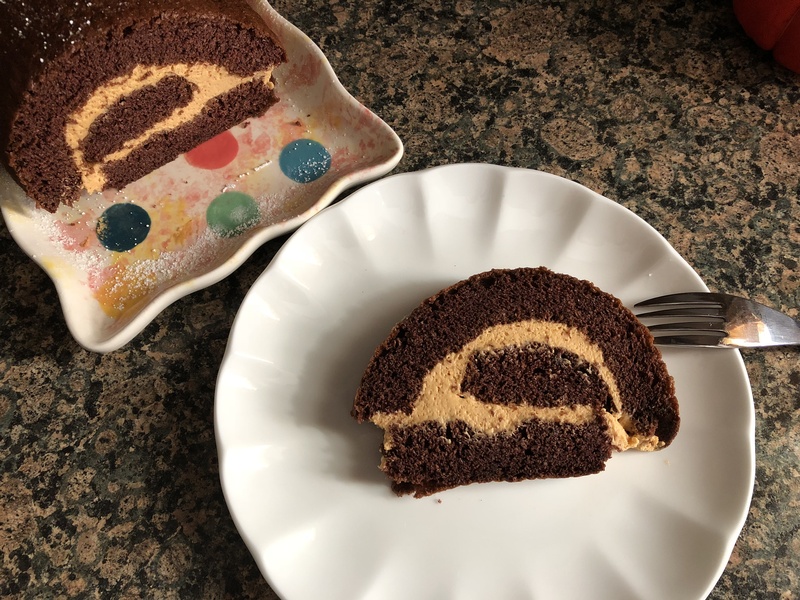 When pouring the batter, swirl the batter as your pour to ensure it covers the entire pan.